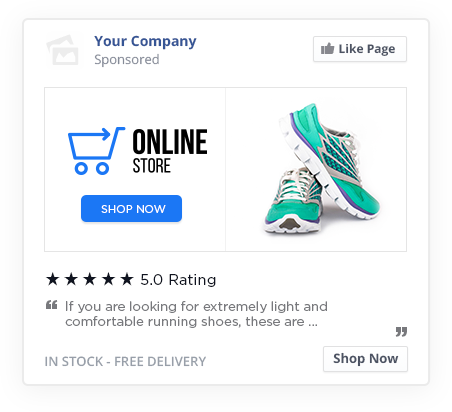 Reviews Facebook Retargeting Ads are easy to create and a great way to re-engage your potential customers throughout the Facebook platform. 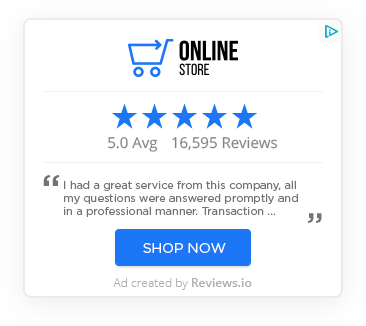 You can create ads with both company and product reviews. Reviews.co.uk helps companies turn individual product and company reviews into beautiful ads. Adding the voice of your past customers into display advertising improves trust and increases chances of conversion. 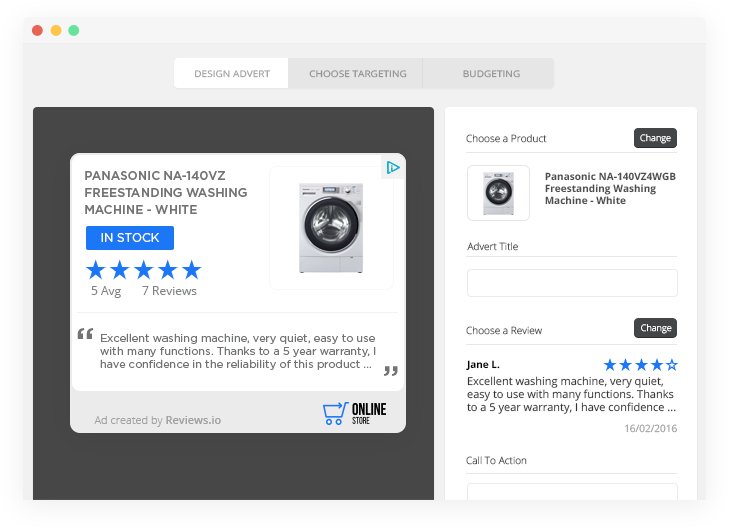 Reviews.co.uk 'personalised targeting approach' helps companies turn individual product and company reviews into retargeted ads. We give companies of all size a world class "Word of Mouth" marketing solution. 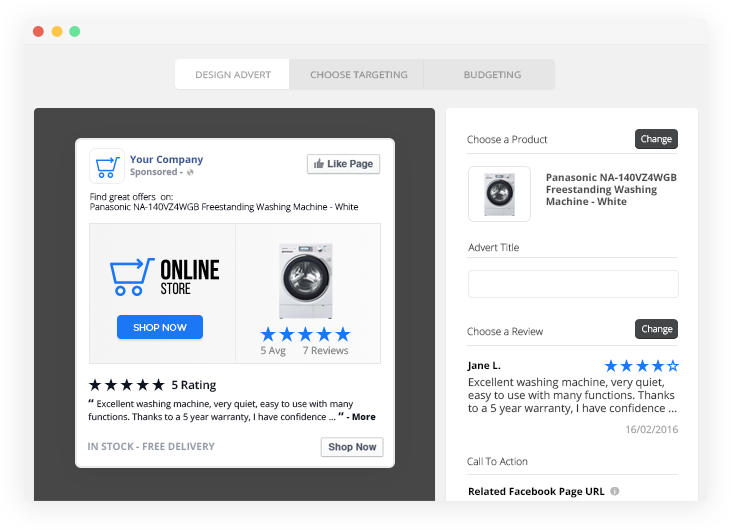 Reviews Facebook Retargeting Ads are easy to create and are three time as effective as normal Facebook Dynamic Ads. We have seen conversion costs drop by up to 77%. Company Review Adverts leverages the power of your company's reviews. These adverts can include other marketing messages i.e discount codes & special offers. 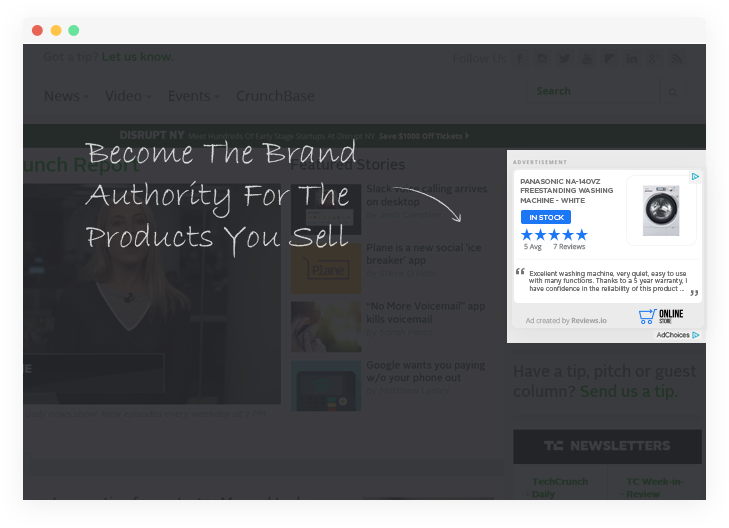 Turn your best Product Reviews into Facebook adverts with just a couple of clicks. These highly targeted adverts are excellent at re-engaging with your potential customers on the world’s biggest social media platform; turning a possible customer into a definite customer. Facebook is a truly mobile platform and now has more visits via mobile than traditional desktop. 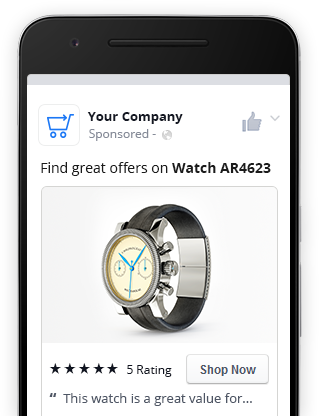 Our ads are built with Facebook's mobile users in mind. 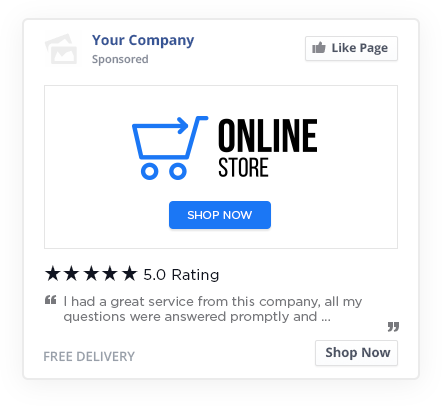 Facebook reviews adverts are very quick and easy to create, simply build the ads in your Reviews.co.uk account and hit publish. We handle everything else. 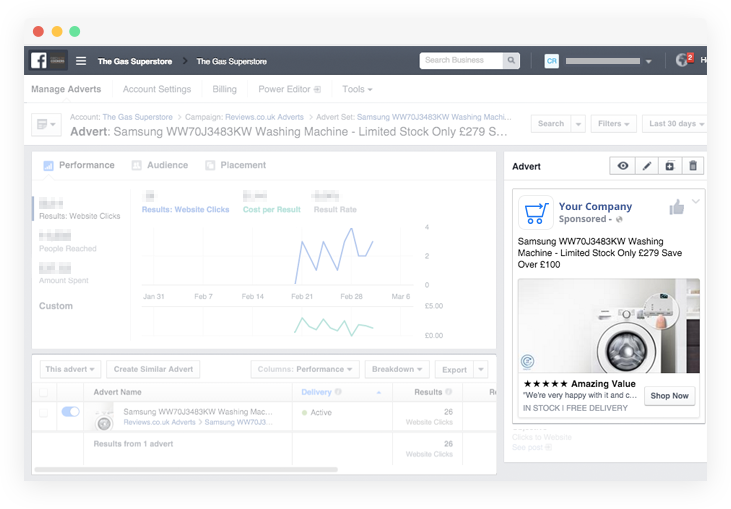 Once you have created and published you Facebook Ad you manage it via the Facebook Ad Manager. From here you can tweak your bidding strategy and even modify the copy. Want to see how Google Ads work? 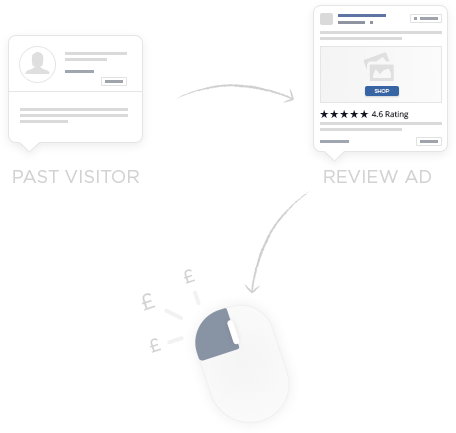 Google Retargeting Display Ads are delivered through the Google Display Network. Display ads offer an excellent opportunity to build customer trust, increase brand awareness and ultimately help you sell more products or services. 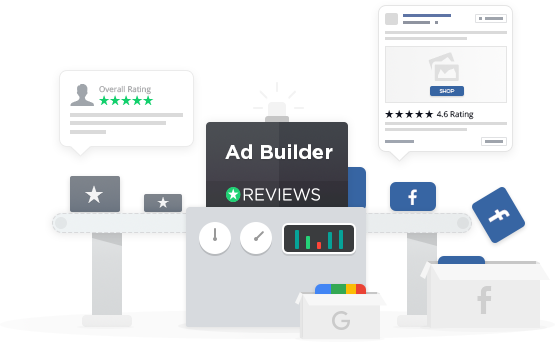 Turn your best reviews into beautifully designed Google Display Adverts easily. It is no secret that online shoppers trust companies a significant amount more when genuine reviews are included in their marketing adverts. Ads that display reviews see a direct lift in CTR and conversion. 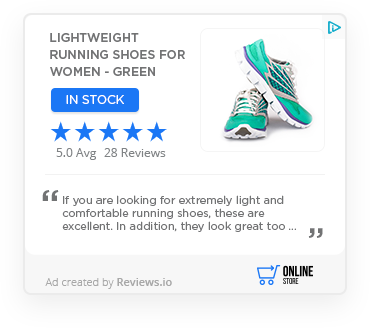 Product Review ads have excellent long and short term conversion qualities. They help give you exposure for very little investment, plus they are a great way to re-introduce potential customers back into the conversion funnel. We have made it very quick and simple to create high quality display ads. 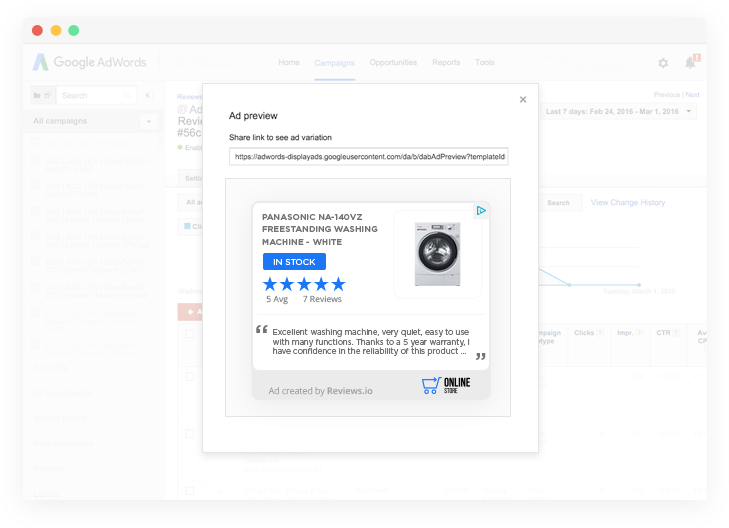 These ads are created in your Reviews.co.uk dashboard then they are injected into your Adwords account via our secure software. 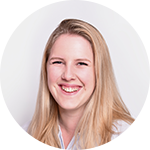 Once the advert has been created and injected into your Adwords account you can manage the advert and track its performance via your own Adwords account. Google Display adverts are visible accross Google display network. 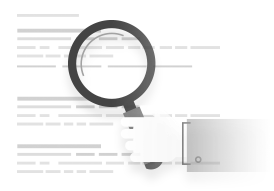 The adverts are highly targeted so they are only shown to visitors who have performed specific actions on your website. Want to see how Facebook Ads work?